Such an easy look to pull off when you only have 5 seconds to get dressed. Spend my afternoon yesterday with two babes for a lunch date. I’m now on my way to ‘de Ijhallen’ (a flea market in Amsterdam), to sell my stuff together with my bestie. What are you guys up to? Enjoy your weekend! That outfit is absolutely gorgeous!!! Fantastic style! I love this kind of outfit, so easily chosen and yet so stylish! For me, this is a week end of christmas preparation. Have a good day! 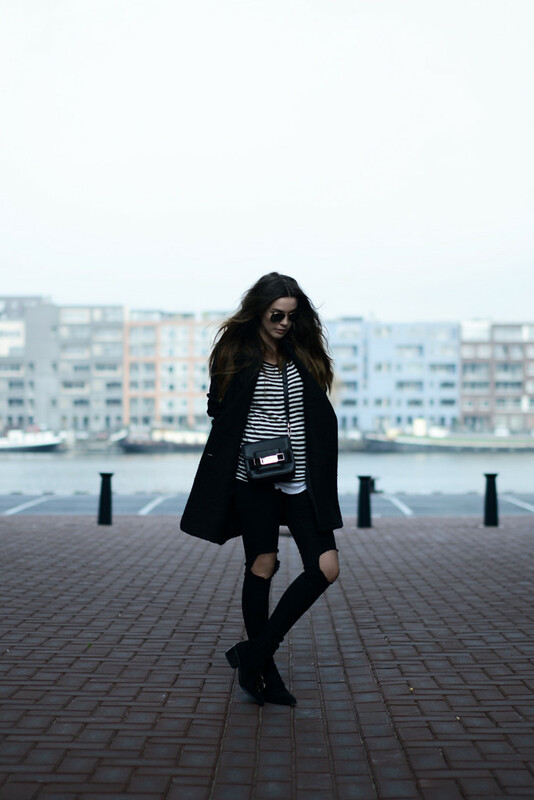 Mooie outfit en foto’s weer! Die broek is zo gaaf! Staat je super :) Jammer trouwens dat ik niet in de buurt woon, anders was ik zeker even gaan kijken bij de Ijhallen, ben wel benieuwd wat je allemaal verkoopt ;) Anyway, succes met de verkoop! Prachtige jas en tas <3! A beautiful misterious outfit! I love your coat. amazing look! love your combinations, always simple, never boring! Ik heb ZO’n zwak voor gestreepte tops, vind dit dan ook weer een geweldig outfitje. Veel plezier in de IJhallen! perfect look, you look as always amazing! Could you share with us some selling tips from Ijhallen? What is the price range to sell, lets say a leather jacket, or a simple t-shirt, or a pair of boots?. New condition. We go there on the 5th of Jan. for the first time and dont what to expect when selling my stuff. Cool that you are going to sell as well at the Ijhallen. It was my first time too and I have learned a lot haha, and unfortunately I didn’t earn a lot. :P But I had a super fun day together with my bestie, and that is what counts in the end. But really, you will probably don’t leave with a big bag of money. I highly recommend you to NOT sell your new condition, good stuff. Because they only want to pay pocket change. For example a girl didn’t buy a brand new denim jacket (worth 80 euro), because I asked 1 euro for it. I was stunned haha. I sure had some good laughs though! Next time I will not bring things in good condition or that have never been worn, because it’s just a waste to receive 1 or 2 euros for it (if you are lucky, I think everyone expected 50 cents for an item or something). A brand new jeans with tags on it from the brand Edwin was sold for 3 euros, 5 euros was too much for everyone who asked, so I lowered my price for a sweet girl. PS: Go as early as you can, because the sellers will make their round before the visitors can enter the Ijhallen and that’s when I made 50% of my sales. In the end we left with 250 euros – which we had to split in two hahaha – and we had a whole station wagon full of stuff! Thank you so much for your feedback. But WOW, the prices are crazy. Seriously!!! I am used with selling them on marktplaats but that price is ridiculous, but at least you had fun :) Have you bought something for yourself?. As it opens first at 9am, heard that you are not allowed too early in the hallen. Will look at it as an experience and give it a try :) Maybe I will have fun as well. Yes, I know! I couldn’t believe it either. I always thought people at Marktplaats are cheap, but this is much worse haha! No, I didn’t bought something myself, I didn’t took a look because I was busy selling my pieces for 50 cents :P haha! Great stand-by or “default” look, cannot fail! Super! Ik vind het geweldig!! You know what Cindy? U just inspired me what to wear for 2night! I have very similar pants and they are lying in my closet for so long that I actually forgot about them… :) Thnx! As always I’m delighted. Your style and these amazing photos – pure genius!